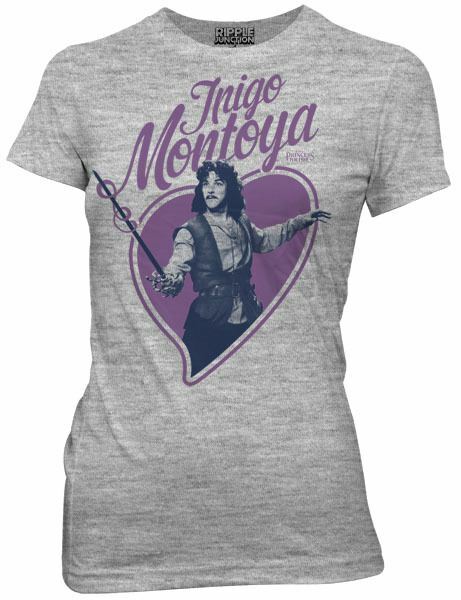 Check out our discoveries of the most awesome Princess Bride T-Shirts below. We simply find and round up all Princess Bride T-Shirts scattered around the Internet that we think are cool so that you don't have to. If you find these Princess Bride T-Shirts really cool, do not hesitate to share with your friends. 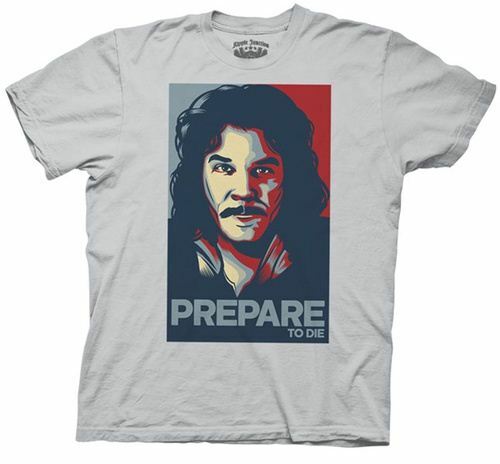 This Princess Bride shirt features a print of Inigo Montoya about to strike! 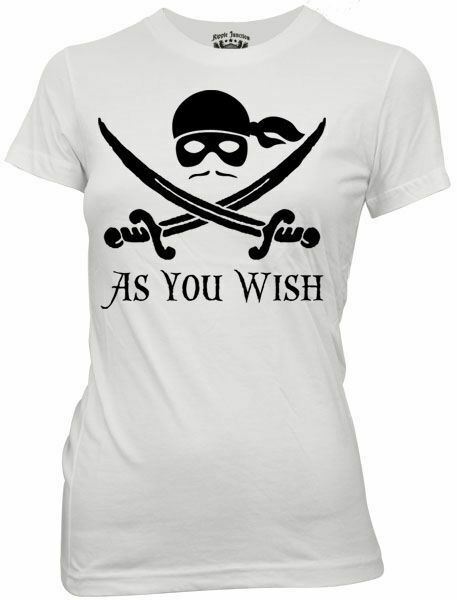 This Princess Bride shirt features the Dread Pirate Roberts mustache, mask, and bandana as well as the quote “As You Wish”. 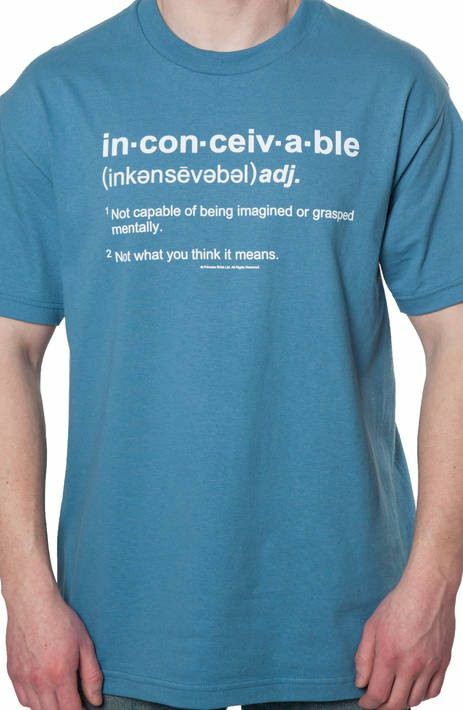 This Princess Bride t-shirt features the Florin dictionary definition of the word “inconceivable”, which became a catch phrase for the Sicilian criminal mastermind Vizzini. Even though he was the one that fell for one of the classic blunders, Vizzini remains one of the most popular characters from the classic 1987 movie The Princess Bride. 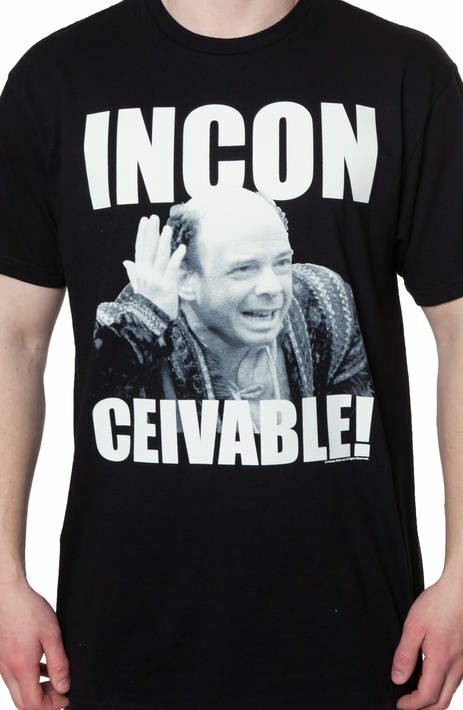 Now, you can show that you are a fan of Vizzini with this Inconceivable Definition Princess Bride t-shirt. Iocane not included. This Princess Bride t-shirt shows an image of Fezzik, the giant that loved to rhyme. 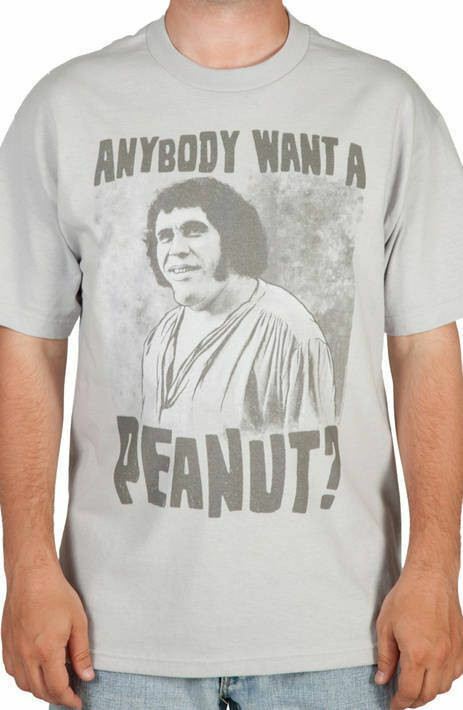 Featured here is his famous “Anybody Want A Peanut?” response to Vizzini saying “No more rhymes now, I mean it”. 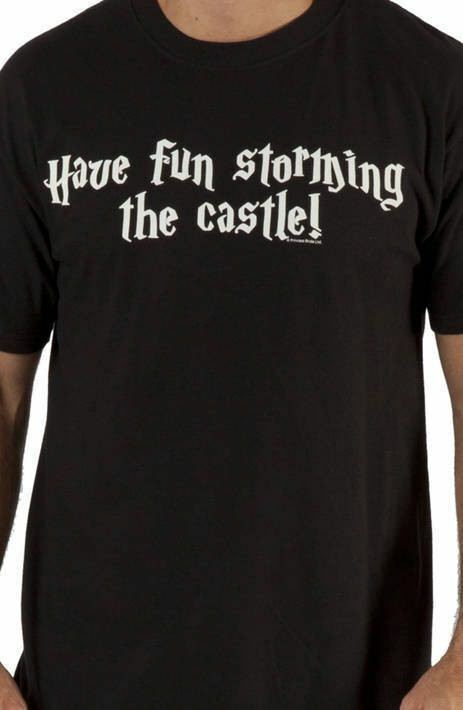 This Princess Bride shirt features Miracle Max’s line “Have Fun Storming The Castle!”. 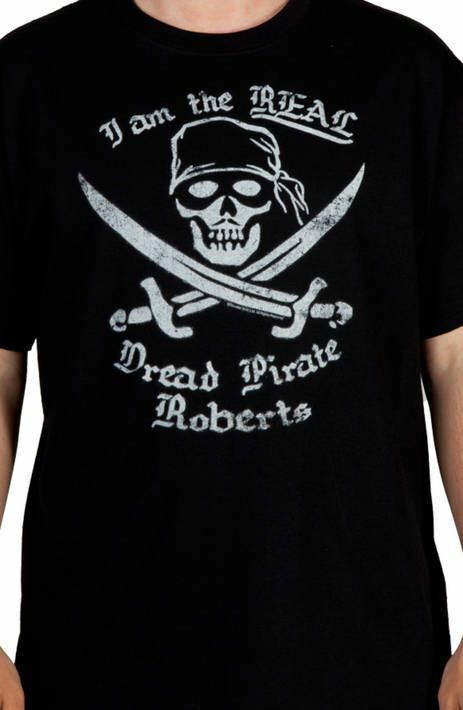 This Princess Bride t-shirt shows an image of Dread Pirate Roberts and the quote that he would say to Westley each night aboard the pirate’s ship. This Princess Bride shirt features a white print of Inigo Montoya. 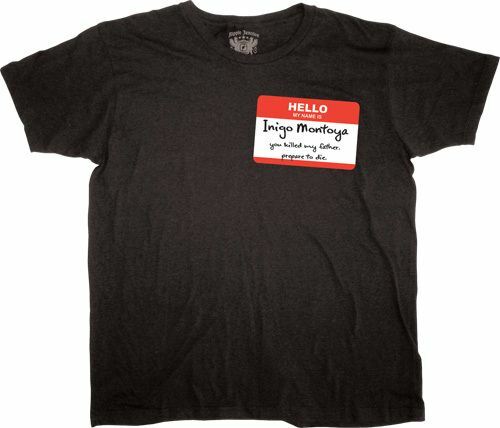 Under Inigo, the shirt reads “My name is Inigo Montoya, You Killed My Father…” The quote is printed with silver foil. The back of the shirt finishes the famous quote with, “Prepare to Die”. 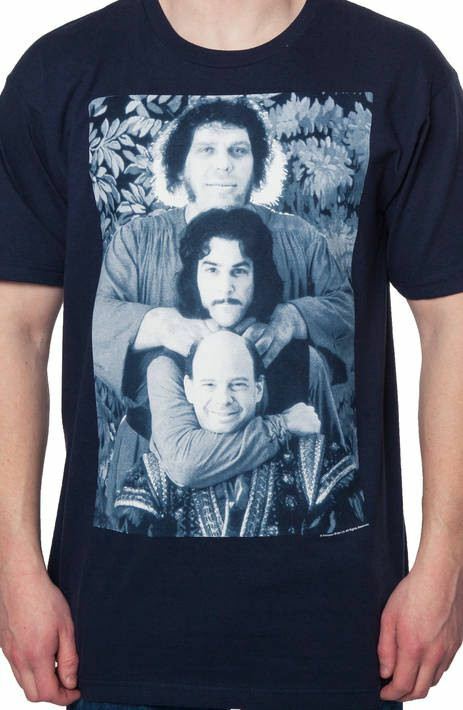 This Princess Bride shirt features an image of three kidnappers. The outlaws that appear on this shirt are a giant named Fezzik, a swordsman named Inigo Montoya, and a Sicilian boss named Vizzini. These three men were involved in a prestigious line of work with a long and glorious tradition. These men were also all bested by Dread Pirate Roberts. Fezzik was choked out, Inigo Montoya was defeated in a sword fight, and Vizzini drank poison during a battle of wits. 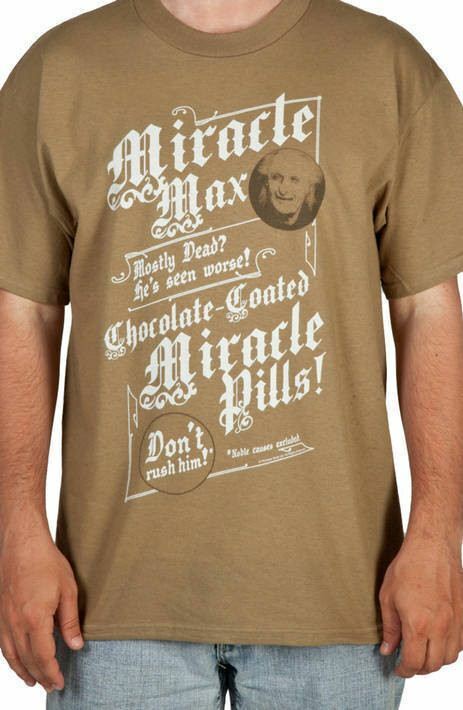 Any fan of The Princess Bride not wearing this 3 Kidnappers shirt is inconceivable! Dread Pirate Roberts has never been just one man, but a series of individuals who periodically pass the name and reputation to a chosen successor. With this shirt, you can claim to be next in line to carry the feared title. 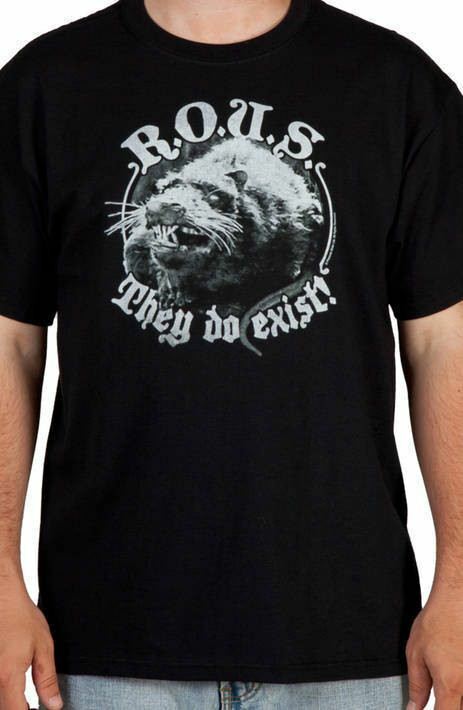 This Princess Bride t-shirt is a great reminder that Rodents of Unusual Size do exist in the Fire Swamp. Westley found this out the hard way after rescuing Buttercup from lightning quicksand in the classic 1987 film. Westley destroyed one ROUS, but many more are surely still waiting to attack. 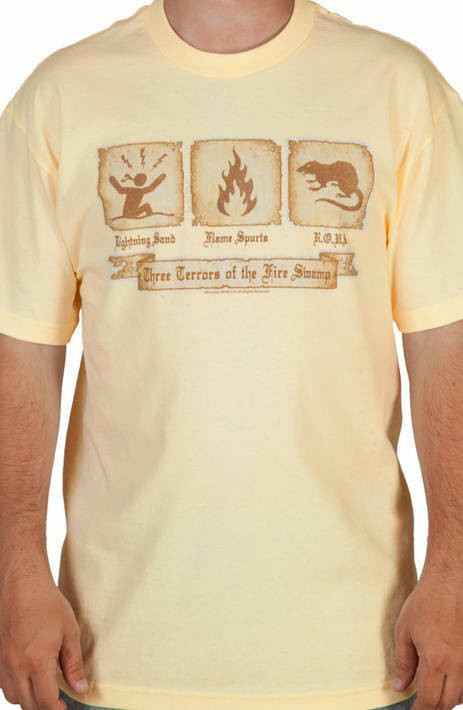 This t-shirt shows the Three Terrors of the Fire Swamp: Lightning Sand, Flame Spurts and Rodents Of Unusual Size. These were three obstacles that were met by Buttercup and Westley in the 1987 film, The Princess Bride. This Princess Bride t-shirt shows an image of Billy Crystal as Miracle Max and also features some of his most memorable quotes. Crystal’s small scene (along with Carol Kane) helped to make The Princess Bride a true classic from the 1980’s. This Princess Bride t-shirt shows an image of Valerie, the wife of Miracle Max. Valerie and Max are known to hurl insults at each other. Max has referred to Valerie as a witch. This Princess Bride t-shirt shows Inigo Montoya and the Man in Black with their swords drawn, about to engage in battle. With the clever and humorous dialog of the film, each man says: “You seem a decent fellow”. 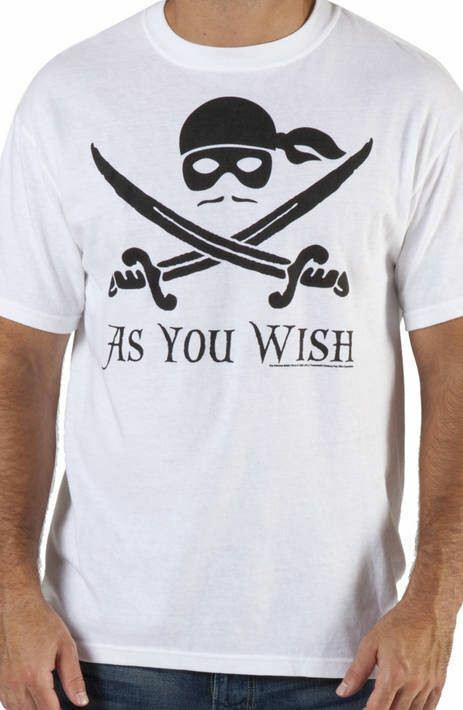 Wearing any other shirt for your next sword fight is inconceivable. 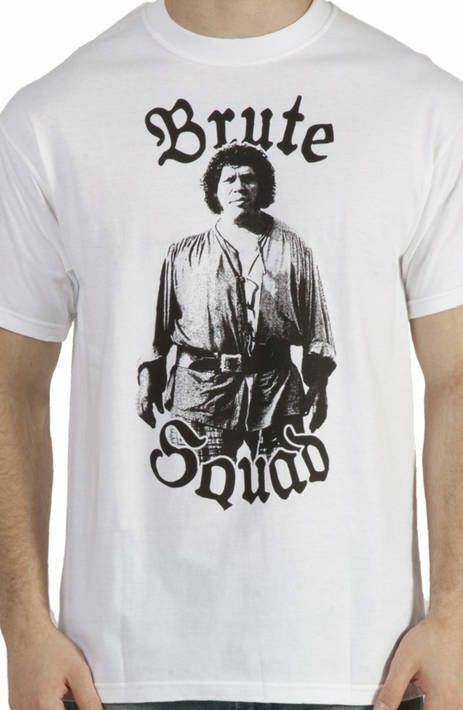 This Princess Bride shirt features Andre the Giant as Fezzik, the lone member of the Brute Squad. When you are as big as Andre the Giant, you qualify as your own squad. 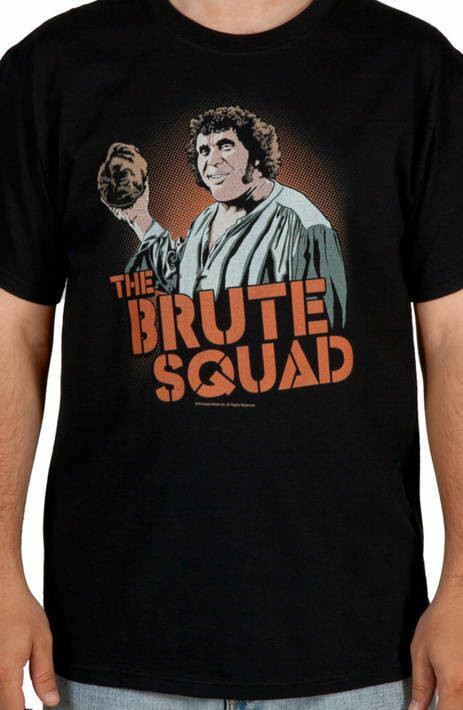 This Princess Bride t-shirt shows an image of Fezzik, a giant who doesn’t even excercise but is still strong enough to be a one-man Brute Squad. In this picture, Fezzik is preparing to put down his rock so that he can kill the Man in Black like a civilized person. This Princess Bride shirt features an image of Wallace Shawn as Vizzini in the classic 1987 fantasy movie. 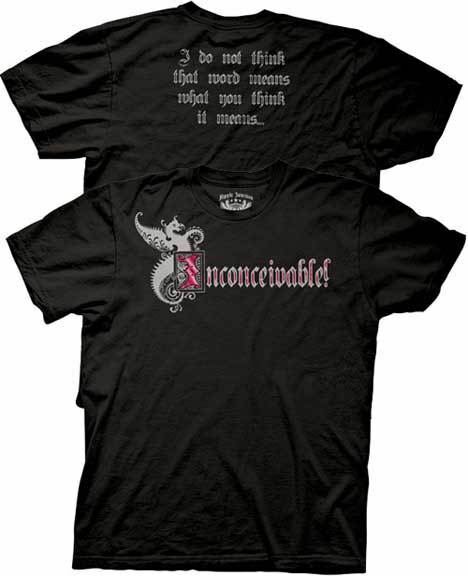 The shirt shows the word Inconceivable, which became a catch phrase for the Sicilian criminal mastermind throughout The Princess Bride. 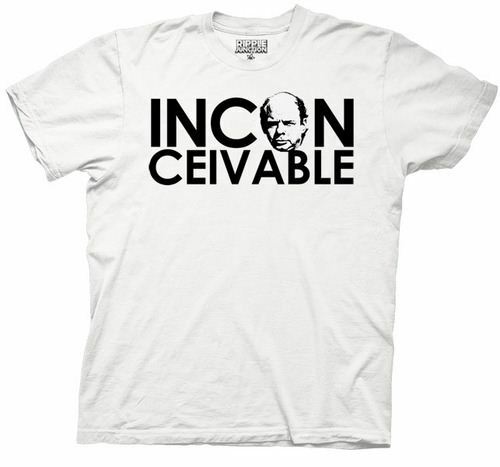 Now, you can show that you are a fan of Vizzini and his prestigious line of work with this Inconceivable Princess Bride shirt. 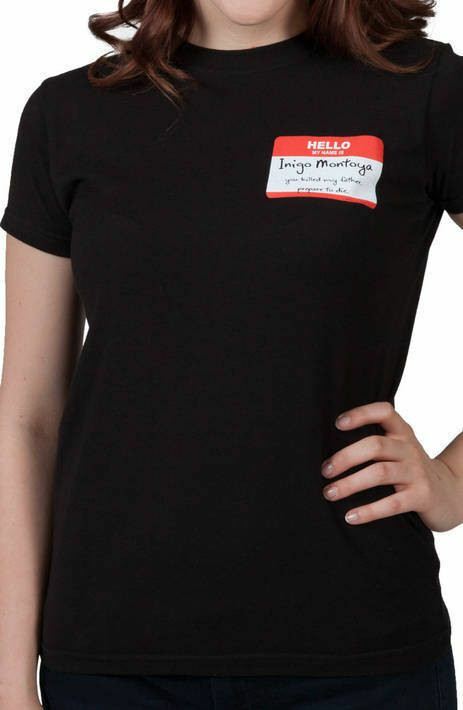 This Princess Bride Junior shirt features a generic name badge with the name of “Inigo Montoya” filled in and the caption “…you killed my father, prepare to die”. Remember when Andre the Giant starred in the cult classic The Princess Bride? 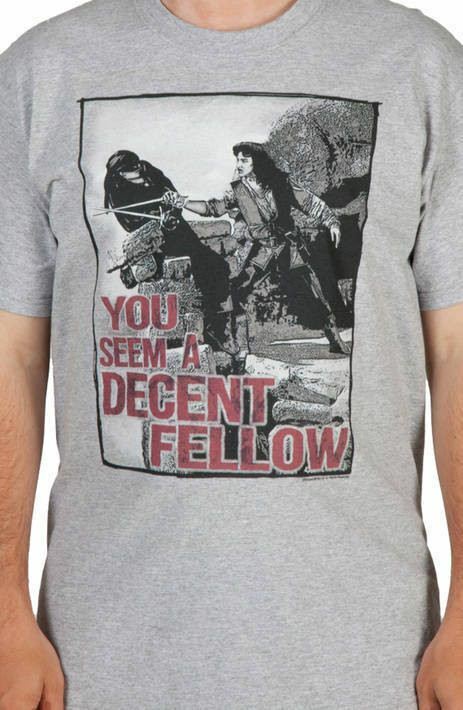 If you have fond memories of Andre, this officially licensed Princess Bride t-shirt is sure to please. Featuring his most memorable line from the film, this Fezzik t-shirt is a great way to show some love for everyone’s favorite rhyming giant. 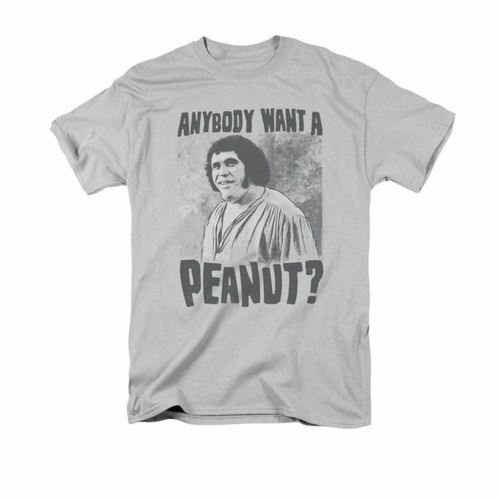 Let the world know that you’re a fan of this hilarious movie with the help of an awesome Andre the Giant t-shirt! Oh, by the way, anybody want a peanut? If anyone knows how to introduce themselves, it’s Inigo Montoya. Of course, he always seems to be threatening people with his greetings, but that’s just a side effect of searching for your father’s killer. Whether you’re on a similar quest or you just want to show your support, this officially licensed Princess Bride t-shirt is perfect for any fan of the film. 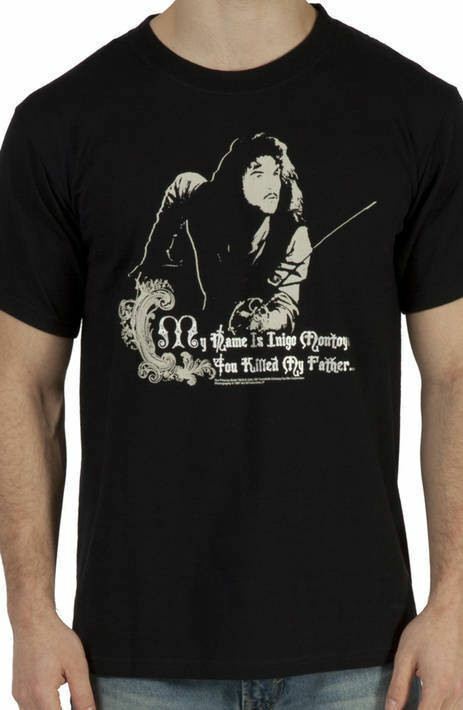 Share one of your favorite movie quotes with the world when you wear this hilarious and memorable Inigo Montoya t-shirt! Save your breath! 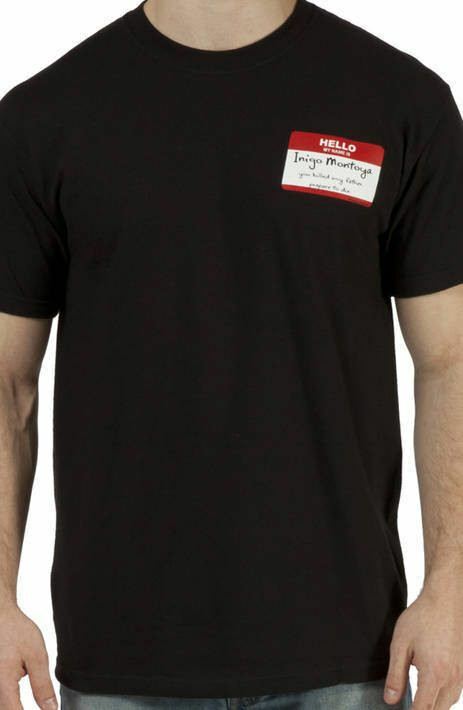 This officially licensed “The Princess Bride” juniors t-shirt features the classic fantasy film’s most famous line printed on a name tag: “Hello, my name is Inigo Montoya, you killed my father– prepare to die.” It’s the perfect attire for fencing wizards. 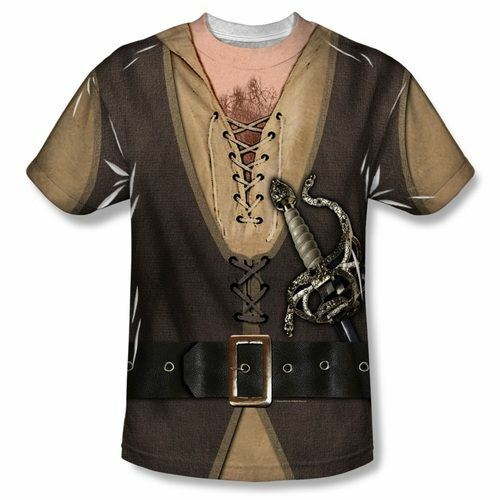 If you’re a true fan of The Princess Bride, you’re going to want an officially licensed Inigo Montoya t shirt from TVStoreOnline.com. Famed character Montoya, a Spanish fencing master, is one of the comic reliefs of the film. He has his own storyline throughout the movie, seeking revenge against his father’s killer, a six-fingered man. His line “Hello, my name is Inigo Montoya. You killed my father. Prepare to die,” is one of the most famous lines in movie history. 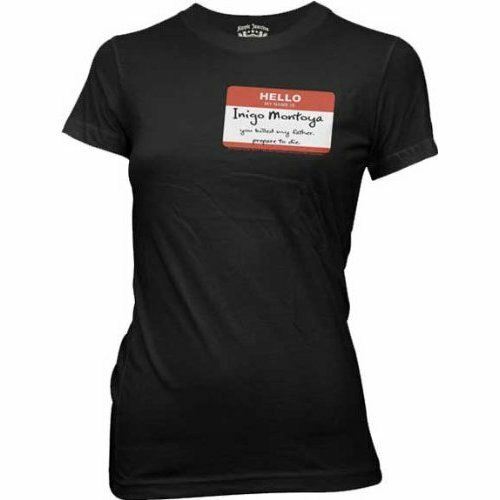 Show that you’re a true devotee with a Hello My Name is Inigo Montoya t shirt. Relive the unforgettable fencing duel between Inigo Montoya and the Man in Black with this officially licensed “The Princess Bride” t-shirt. 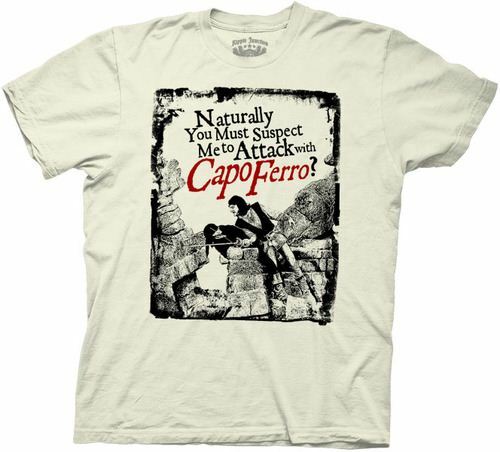 The white cotton tee features a print of the pair locked in combat alongside Inigo’s famous line, “Naturally you must suspect me to attack with Capo Ferro?” Naturally… but I find that Thibault cancels out Capo Ferro. Don’t you? 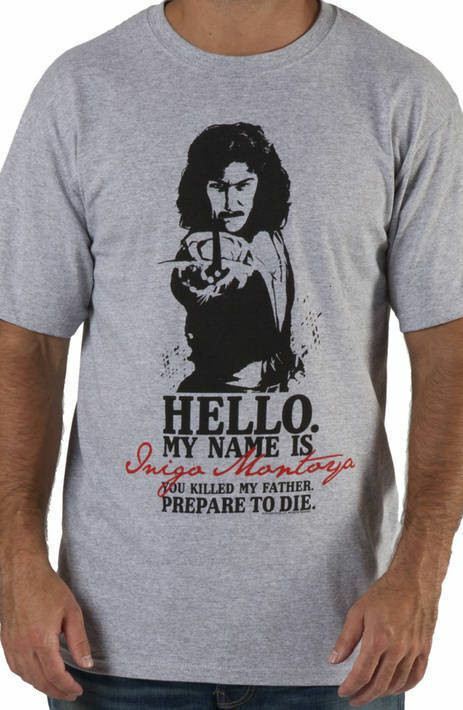 “Hello, my name is Inigo Montoya, you killed my father– prepare to die.” Skewer your enemies (and political pop art) wearing this officially licensed “The Princess Bride” t-shirt featuring the immortal words of Inigo Montoya. This silver cotton tee is printed in the style of the Shepard Fairey’s famed Obama “HOPE” poster. His name is Inigo Montoya, you killed his father, prepare to die. This officially licensed Princess Bride t-shirt features Inigo Montoya with his famous greeting.If you think everything is inconceivable, or if you’re just a really big fan of The Princess Bride, why not show it off with this officially licensed t-shirt? 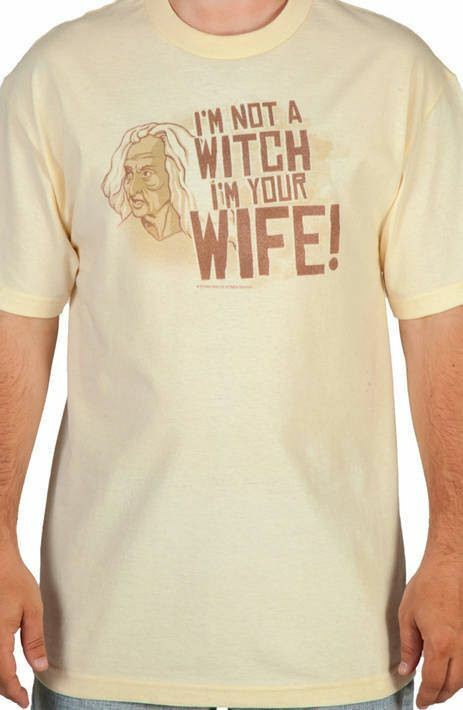 If you’re a fan of Princess Bride, let the world know with this cool shirt! His name is Inigo Montoya, you killed his father, prepare to die. 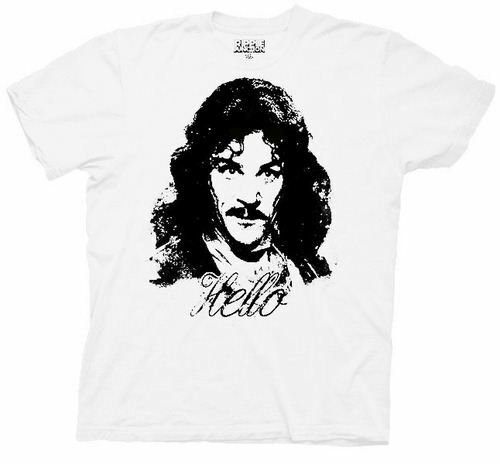 This officially licensed Princess Bride t-shirt features Inigo Montoya with his famous greeting. 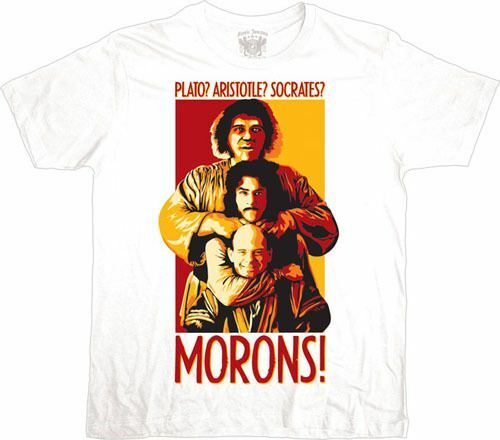 If you’re a fan of Princess Bride, let the world know with this cool shirt! His name is Inigo Montoya, and he’s the star of this funky gray juniors tee! 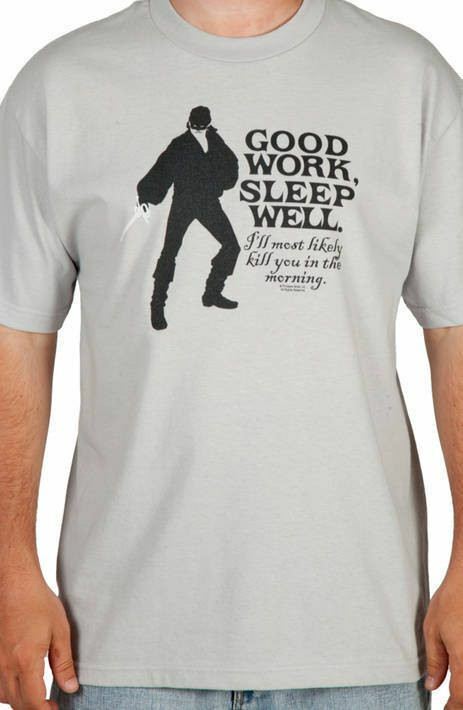 This officially licensed “The Princess Bride” fitted t-shirt features the quotable swordsman from the 80s fantasy classic. Order yours today and show Inigo a little love!